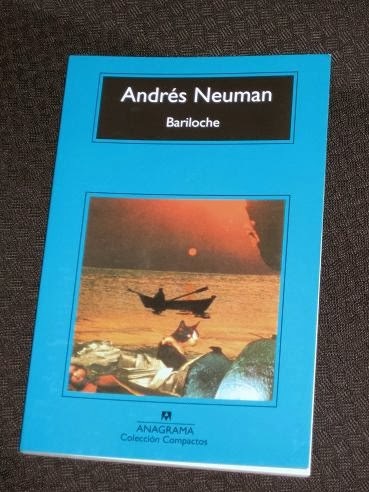 Bariloche is the first novel of Argentine-Spanish writer Andrés Neuman, he of Traveller of the Century fame. It’s a much shorter and simpler book than his IFFP-shortlisted work though, and is centred on the life of Demetrio Roja, a rubbish collector in Buenos Aires. Every day, he goes to the depot where he and his work partner cruise the empty streets of the Argentine capital, removing unsightly rubbish before the rest of the city starts its day. Bariloche consists of sixty-five short chapters, several lasting less than a page, while the penultimate chapter, the longest in the book, only runs for six pages. Initially, these scenes of urban life are merely snap-shots of Demetrio’s daily routine, but as the novel progresses, we are treated to more glimpses of his life before his arrival in Buenos Aires, in particular, of a relationship he has which ends abruptly. The observant among you (i.e. those who have actually read the post carefully) will have realised by now that it wasn’t the book that was difficult but the fact that I was reading it in the original Spanish. Sadly, Traveller of the Century is, at this point, the only one of Neuman’s books to have appeared in English, and having read it twice and loved it – and having caught up with the writer at the Melbourne Writers Festival -, I was keen to try another one. If I’m being honest, it would be hard for anyone to take my review at face value as I did struggle with the book at times. The first few days saw me read about seven pages at a time, with constant stops to look words up, and I really thought I had bitten off more than I could chew… However, I slowly got the hang of things, and my long-term memory kicked in, allowing me to double that by the end of my two weeks of reading. While there were still words I didn’t know, I opted for fluency over complete comprehension where possible, especially if I sensed that not knowing a certain word was unlikely to affect the flow of the story. I did get a lot out of Bariloche, especially when contrasting it with Traveller of the Century, as it allowed me to compare the two books and draw out some parallels with, perhaps seeds of, the later, longer novel. Demetrio’s illicit affair has shades of Hans’ relationship with Sophie, and an old homeless man the rubbish collector befriends may well be a literary ancestor of the Organ Grinder. The care taken when describing the streets of Buenos Aires (and the beauty of Bariloche) is also repeated in Neuman’s later description of Wandernburg. Finally, the picture of Demetrio poring over his jigsaw puzzles in a grotty bachelor pad evokes images of Hans sitting in his room at the inn, dictionary in hand, working away at his translations (which, in turn, is uncannily close to the image of Tony turning frequently from book to i-Pad in a desperate attempt to make sense of it all…). Blimey, well done & I think I'll wait for the translation, not because I wouldn't try the original, but I wouldn't want to put a translator out of a job – Honest!!. seriously congrats & what language will you try next? Tony, first, props to you for giving this a go in Spanish. If I may, though, I think your first quote about the girl being “mayor que yo” should be translated as [she was] “older than I” rather than she was “out of my reach.” Also, Bariloche is actually a city with a population of about 100,000 people and only really a “small town” in relation to Buenos Aires. By the way, I read this earlier in the year and liked it OK without being bowled over by it or anything like that. Many Spanish-language reviewers who really liked the book seemed to think it was some big deal that Neuman used various linguistic registers (i.e. the different narrators speaking Buenos Aires-centric Spanish and the more neutral “international” Spanish used in the third person narration), but I didn't think that was so impressive a feat even though I did enjoy some/many of the short passages for their sort of poetic point of view. Anyway, glad to see you speak about the “sparkling conversation and warmth” of Traveller of the Century. I didn't find those things in Bariloche either (not that it's the type of story that requires them), but I'd like to give Neuman another try in the future since you and Gary and Stu and others have spoken so highly about novels of his that I've yet to read. ¡Saludos! Richard – Thanks for the advice (and if that's the only mistake in those two quotes, I'm more than happy!). As for town v city, I'd still call that a town, although probably not a small town – that's my UK usage, and other varieties of English may use the word differently. I enjoyed it, but I do recognise that it's not a mature, fleshed-out work like 'Traveller of the Century'. I like the idea of the different styles for the prose and dialogue, even if (as I mentioned) I really struggled once they got going in Buenos Aires slang. I didn't put this in the review, but there was one part where it went from a really slang conversation into a beautiful, imagery-laden paragraph, and the juxtaposition of styles worked really well. First off, you are to be emphatically congratulated on your Spanish and your bravery in tackling the original. I wait for the day when I'll be able to read an entire book in the original German… but it'll be The Neverending Story, which I've already read in two languages, so it's cheating just a bit. And this reminds me that I just ordered Traveler of the Century (Hardcover! Cheaper than the paperback! It was a bargain I couldn't resist, even if it's from Amazon). So while Bariloche will have to wait, I have at least one Neuman on the way. Definitely a result of your enthusiastic endorsements. Stu – Not sure it'll make it into English (not unless Andrés takes out one of the major world lit awards, anyway! ).